Brevity & Wit worked with Population Services International to turn focus group data into a data visualization that would help field staff make program decisions. Population Services International (PSI) approached Brevity & Wit to create a “journey map” that would illustrate the experiences of Cambodian women seeking access to safe and legal abortion. PSI had conducted a qualitative study, consisting of focus group discussions with women who had received an abortion and with community members, which helped document societal attitudes and barriers to access. The data was both impressive and actionable, but with a 148-slide deck presentation, it was difficult for program implementers to glean insights. PSI wanted to create a “journey map” of the data so that teams could “see the forest from the trees,” but traditional data visualizations – with their reliance on technology and limitations for real-time collaboration – would not work in this context. Brevity & Wit collaborated with PSI to create a 4’ x 6’ print poster with lots of white space, which would be easier for field teams to view simultaneously and annotate with questions, comments, or insights. Brevity & Wit took a design thinking approach to the problem, working with the client to understand the intended use of the final document as well as the country context, generating ideas on whether a digital or print format would be more beneficial for implementation. Brevity & Wit then plotted data points and presented a basic sketch. We then sought feedback from the client as we converted the prototype into a professionally designed document. A print posted was chosen for two reasons: 1) the program team was in a low-resource country where Internet access was unreliable, and so any computer-based representation of the data would be subject to potential blackouts or interruptions in service, and 2) PSI wanted the data to foster collaborative discussions and actionable insights. Gathering around a small computer screen is hardly the best presentation of data for collaboration, and projecting the data on the large screen does not allow participants to mark, annotate or change the data in real-time. Brevity & Wit thus suggested a paper poster, 4-feet by 6-feet, that could hang in the country office and be annotated with post-it notes or markers. The map also used visual cues, such as color coding and icons, to facilitate faster understanding of the qualitative data. Along the center line of the map we tracked the stages of the journey – from discovering one is pregnant to discussing options to post-abortion care. Below that center line, we color-coded the knowledge and emotions reported by the women undergoing the experience. Obviously, not all women in a focus group reported the same feelings. We need to represent the intensity with which a feeling was felt without resorting to percentages, which would inaccurately represent the small sample size. Thus, we used a star-based rating system, with four stars meaning all participants, three stars indicating most, two stars indicating half, and one star indicating a few. Above the center line mapping the stages of the journey, we mapped out the knowledge, perceptions of community members, and potential external influencing factors on the women. We also highlighted potential barriers for women with an exclamation sign. At the bottom of the map, we created a “Data for Action” bar that allowed team members to add their insights and suggest possible ways to improve the experience for women. The dotted line allowed them to separate out what behaviors they wanted to change versus those that they wanted to reinforce. 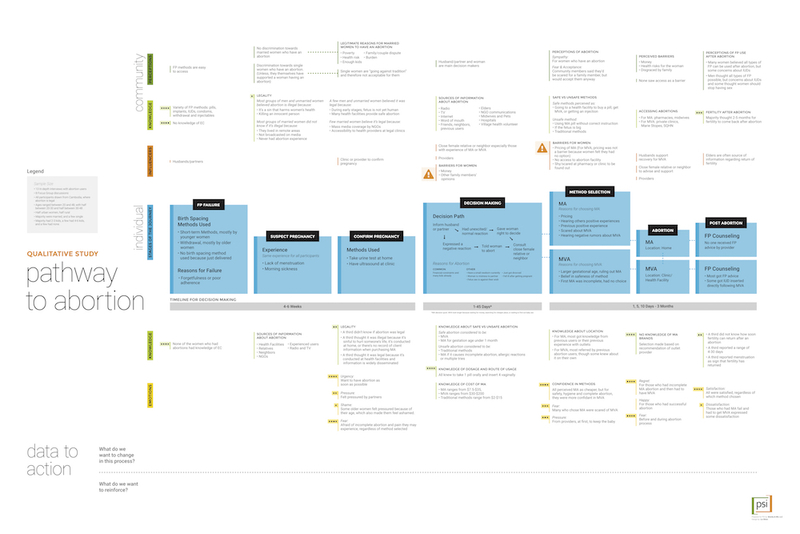 The client was highly satisfied with the Journey Map, which was presented at a regional retreat and garnered high engagement from the audience of PSI staffers. We are now exploring ways to make this sort of data visualization easier for teams on the ground, perhaps by employing PowerPoint templates instead of using Adobe Illustrator. When deploying such a template, Brevity & Wit also provides training to researchers, technical advisors, and other staff so that they had the capacity to easily map data and glean actionable insights to better inform their health interventions around the world.